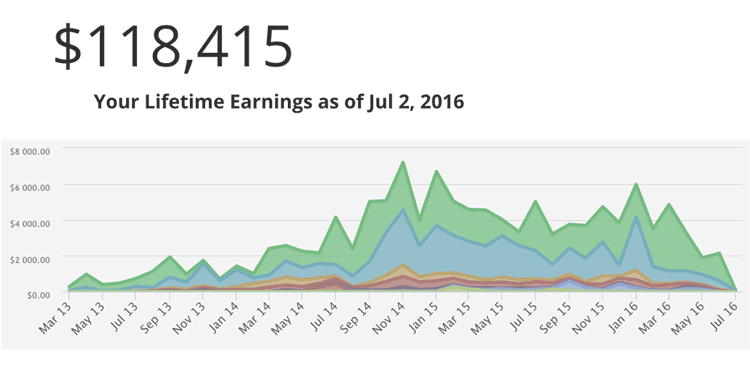 Every three months I detail the passive income profit I’ve earned. I earn “passive income” through video course sales, e-book sales, physical product sales, affiliate commissions and advertising. I also earn “active income” by providing graphic and web design services for clients. However, one income stream has dwarfed the others – I have been making around $4000 a month from Udemy for nearly two years and, although I tried to get my other passive income streams to match Udemy, none have even come close. And now the inevitable has happened … Udemy’s constant income stream has dried up into a trickle due to their pricing policies. So, suddenly, my main source of passive income is more than halved! Lucky for me that I have many passive income streams and lucky for me that I still earn active income from web and graphic design services. One of the reasons I publish my passive income reports is so that others can learn from the bad days as well as the good. Last quarter I made $16,027.20 passive income profit. The target for this quarter is $20,000. Let’s see how I got on. Udemy is an online learning platform. I thought I knew how to make money on Udemy as it had been my most consistent passive income earner for two years. However, Udemy is a company that has historically tested the patience of its stakeholders. Constant policy changes, fake reviews, fake student numbers, rampant piracy and poor communication are the oft-cited reasons for discontent. This quarter, we have $6,829.22 – meaning an income source that would consistently turn in revenues of $4000-5000 a month is now performing at $2000 a month despite my publishing new courses. Why the staggering drop? 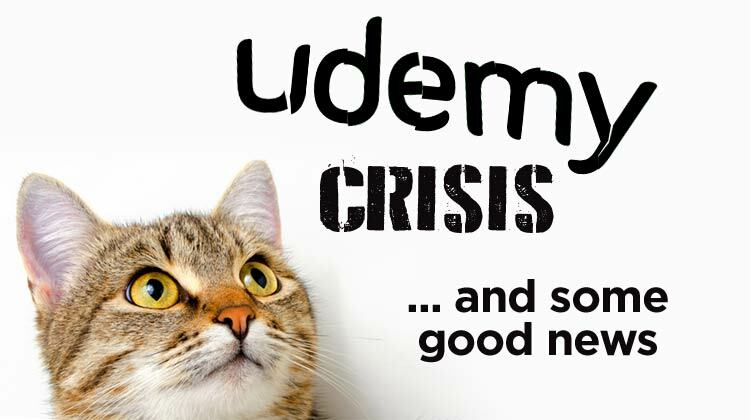 On April 4th 2016, Udemy introduced a new course pricing strategy and stopped deep discounts. At the time they announced this, I thought it would be OK. This is the third major pricing policy change in less than three years. The last one benefitted me. I thought, Udemy have more information about their customers than I do, they must know what they’re doing. However, now I’m not so sure. We shall see. But I’m almost giving up on Udemy as a viable income stream for the future. Here’s an article I wrote about alternatives to Udemy. 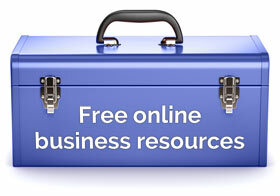 Skillshare is another online learning platform that I have my courses on. Again, it’s consistent passive income but not nearly at the levels of Udemy. StackSkills is a site that bundles together courses and sells them at an irresistible price. I’ve been involved in a number of their bundles recently and will be next quarter as well. This quarter I made $2,978.51 there. But this won’t carry on forever. I was very excited about the prospect of selling videos on Amazon Video Direct when it “launched” around April 2016. There was a lot of talk of the retail giant moving into education. At the moment, however, we have a pretty graph but not a whole lot else. It’s difficult to see how this is going to play out. So far, my material is mostly viewed for free by Amazon Prime members. Sales of actual courses has been slow and this is despite my sending traffic there through my email list. My revenues from the last quarter? $12. OK, so not a lot to write home about. However, this is Amazon so we’ve got to keep our eyes on this one. Read here on how to sell video courses on Amazon Video Direct. There are many more places where you can put courses. Don’t forget deals sites like StackSkills, Dealfuel, etc. And another online learning platform, Stone River eLearning, made me $250.05 this quarter. I also received a $100 payment from SkillSuccess because I recommended an instructor to them. My book about the travelling has been put on the back-burner. 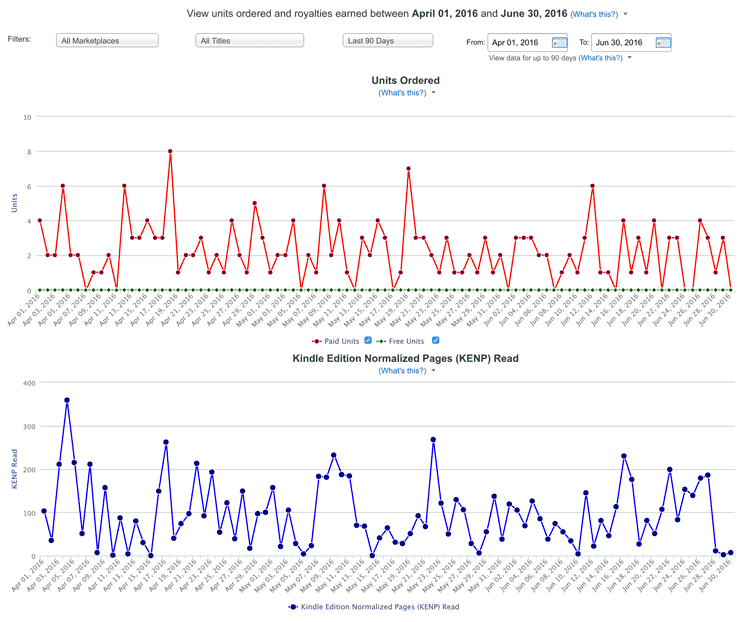 The red line above constitutes book sales; the blue line borrows. OK. So if you’re paying attention, you’ll see my book revenues have increased while my sales have decreased. What’s that all about? I’ve changed my method of calculating the revenues. I’m collating the total from the payments that come into my bank account, rather than the figures from the sales dashboard on the KDP site. Why the difference? I have no idea. Maybe they’re including CreateSpace sales. I’ve also decided to include my Audible earnings, $75.59. So the total from e-book, audiobook and paperback book sales on Amazon is: $632.80. I’ve added these PDF e-books as $9 products in some of my auto-responder sequences – I believe that’s called a “tripwire” product? I also sell my courses on my membership site. Feel free to sign up for one of my free courses. I recently took one of my courses off Udemy and to sell exclusively my own site: Earn $5000+ a Month Passive Income Selling E-books and Video Courses. I’m also temporarily selling my new WordPress beginner course for $9 there – that’s the cheapest it’s available anywhere! This is revenue from ads on my YouTube channel as well as a little bit of Adsense on my website. I am an affiliate for certain products that I recommend or mention here. I get a commission if a sale is made through one of my affiliate links. The links below are affiliate links! This article shows you how to make money with affiliate commissions by blogging. I’ve left the most exciting bit until last! A new passive income stream! At last! My Amazon FBA business is showing profit. But, as I explained in my article, Amazon FBA Business: How Much Money And Time Before I Got Profit?, this is profit on a per unit basis. I’ve spent at least $5000 setting up the business but hopefully that will be paid off soon. However, I’ll be investing in 2nd, 3rd, 4th products as well as buying in new inventory so it’s going to be difficult to calculate going forward. Anyways, my per unit profit from Amazon FBA last quarter was: $2,030.10. I’m not sure if it’ll be the same or more next quarter as I employed a ZonBlast to boost my rankings (at the moment that’s looking like an expensive flop but we’ll give it time). So, if we add it all up. My passive income revenue in the second quarter of 2016 was: $16,227.70 that’s down from $19,596.61 last quarter. Here are the expenses I’ve incurred for this quarter. But I always like to err on the side of caution with these income reports as I’d hate to exaggerate here (and I get haters that suggest I do). So, bear in mind that these figures are always an underestimation. So the revenue (16,227.70) minus the expenses ($2199) is … $14,028.70 … I’m actually quite happy with this. It’s low. Far from my best ($23,000+). But Udemy is now only 40% of my passive income revenues – whereas it used to be around 75%. This can be only good news. My target for next quarter, Quarter 3 2016, is: $20,000 passive income profits. I hit it one day! I have a great free mini course on passive income if you’re interested (it’s filmed in Koh Samui and Chiang Mai, Thailand, exotic, eh?) But seriously, this is free info on how to make a decent income, grow an online personal brand, blog, collect email addresses, selling on YouTube, Udemy, Amazon, and your own site, etc., while sleeping well at night. But this is not get rich quick! Remember, you’ve got to enjoy it. You’ve got to create value. And you’ve got to collect emails! You are always providing great content, I always enjoy reading them you give the good and the bad in your business models, I see that you are a honest person and you don’t hold nothing back. I’m always learning from you all the time, so Rob until next time great success in your business ventures. Thank you, Tony. I appreciate it. Just want to say how much I admire your candidness and indeed ‘transparency’, as Amit has already said. Yes, of course passive income exists, in that you can create something once and reap the benefits from it multiple times. (Or indeed by promoting affiliate products). And of course you can multi-purpose content for various media. I think perhaps what irks some people is that they think the term ‘passive income’ implies no work at all – if only! But good luck to you Rob – as you say, the key in uncertain times is to diversify – as entrepreneurs that is something we’re pretty good at! Hi Jan, I hate to say it but I think you’re right. You wouldn’t think anyone could be so stupid as to think that “passive income” means no work but, I’m afraid, a lot of people actually think this and then get annoyed when they find out it isn’t easy. Yes, as entrepreneurs we become very adaptable, resourceful and get good at diversification. The definition of “passive income” is something that is scalable not something that you don’t have to work at. Amazon FBA doesn’t take any active work at all – I don’t create the product, ship it to Amazon, provide the sales page, arrange the payment gateway, fulfil the order, etc. Even at this early stage it’s proving more hands off that some of my other passive income streams, more passive that creating and selling video courses, for example. Humm, interesting. I will carry on monitoring it. Thanks for documenting how you and your business life is travelling, much appreciated. I am a follower for sure. Loved your Amazon FBA write up of your journey so far. The best part of the post? Could you reveal how is your active vs. passive income? 20 to 80? 80 to 20? Something between? Yes, Michal, you’re right. The most important thing is that I’m happy. And, on the subject of happiness, I’m going to be less transparent from now on as it’s not making me as happy as it once did. So I’m not going to share so much about how much money I make. Anyway, I have said that I have a six-figure business so you can work out what the active revenue is from that. haha great post, i love all the details! I just finished your kindle book From Free Lancer to Entrepreneur. I loved your raw honesty and the way you write about your entrepreneurial experience. After reading this post on your passive income report, I am inspired by your success. I will be coming back to your blog regularly now. You’re amazing! Hey Corey, thank you so much for your feedback. I love to hear from people how they found me and I’m delighted you found me via that book because it was one of my favorites (although not one of the bes-sellers!) Please continue to read the blog and feel free to get some free PDFs and MP3s or some free courses and sign up to my lists in doing so. I’m glad to inspire you, Corey, and I wish you all the best on your journey. My name is Brian Jackson and I’m also a Udemy instructor with 21 courses. First, I’d like to applaud your decision to be so transparent with you income, something I’ve tried to do through the years as an author/publisher and Udemy instructor. Second, if I may, I’d like to provide a pointer to by blog post regarding my own Udemy revenue drop this year. I don’t provide as much detail as you (my publishing revenue is posted separately), but I wanted to share to tell you your not alone. Actually, I’ve suffered a 76% revenue drop. Hi Brian, yes I know I’m not the only one. Anyway, the headline is “Life After Udemy” I’ve been working on Udemy alternatives as well as other sources of passive income for a few years now and I’m glad I have. Thanks for the link. Who made the most money during the Californian Gold Rush? The guy that made the shovels. I’ve been thinking about this as well. I use and have been trying out a number of good SaaS services as a result of my involvement with Amazon FBA. It’s a good idea but I don’t have any ideas at the moment and I have little experience in building SaaS apps. Also, aren’t they also dependent on Amazon, as Amazon could change their SellerCentral APIs and you would have to re-write your code? Or maybe that’s unlikely. Nice idea, though. Thanks for sharing with earnings. You are example that making money online is possible! I met udemy a few weeks ago and I think this is great method to some extra money every month! Thank you. There are many articles on this site about how to win on Udemy. For example, this one. Thank you for your honesty and valuable insights! I sometimes wonder if “passive income” is the right term for so much work. Maybe non-freelancing would be more accurate? As I am making similar figures with freelancing, i.e. roughly 7000 usd/month with 100 hours a 70 usd. My passive projects earn about 25/h, making them almost trice as active. It all boils down to a single question: what is the average revenue with one work hour? I am sure you never counted all those hours, but I’d love to read an educated guess. Hi, Sven, thank you for your message. As for your question I will answer it another way. Passive income is only worth pursuing if you get it right because you’ll make more money than you would do than if you swapped hours for dollars. When you start and set up your business, you’ll put hours in at first and you won’t see a pay back immediately. When you do see a payback is down to the quality of your products or content. Personally, it was worth my while. But every business is different. But there’s no way I can give you an educated guess as to an average revenue, there’s too many variables, it’s impossible to say. I hope that answers your question albeit in a very roundabout way. I’m curious, has this decline in the monthly average you talk about been reversed over the last 18 months or so? I’m contemplating doing some online content, and have mulled it over for a while now, but not “gotten around to doing it” yet. Is Udemy out of contention for good in your opinion? Hey Jude, (sorry couldn’t resist, mad Beatles fan here). The earnings came back but not to where they once were. However, I now concentrate more on selling my courses on my own course site. And I’m glad about that. Udemy is still a decent place to put your courses. I put shorter versions of all my courses there. It doesn’t really take much time to duplicate all your courses there and they do have a 10-15 million userbase. Not bad! However, they do like you to do the marketing and, if you have your own site, you’d rather market that. OK, cool. So, it’s still potentially a decent little side earner by the sounds of it. I’ve planned out numerous videos, structuring them all in a logical sequence. Perhaps once I have that up and running I could set up my own site, I don’t feel I currently have the brand to do that yet, though I’m experienced in what I do.